We love rescuing these poor unwanted, neglected souls but sadly we cant do it without your help. Our outgoings are around $11,000 per month including feed, vet care, supplements, chiro, medication, hospital appointments, training and everything else our horses get. Our rescue horses want for nothing and we pride ourselves on being able to give each and every horse exactly what it needs to get the best start in life. 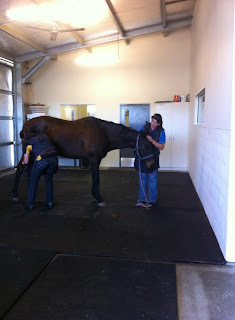 At the moment we have some HUGE vet bills.... Gold Coast Equine Centre is $2,200. Exclusively Equine is $682.28. Samford Vets is $453.70. Nerang Equine Practice is $3198.40. We also have a transport account with Signature Transport for $1374.50. We are URGENTLY seeking donations to get these accounts back down to $0. For everyone who donated money to this campaign someone will be in the running to win a mystery prize... Every donation no matter how big or small will go into the running... The winner will be announced on the 31st of August. Please donated today, even just $1 will make a huge difference to us... You must use your surname as the reference and so we know your donation is for this campaign please use "VET" as the reference as well. This will make sure you get a ticket in the draw. All donations over $2 are 100% tax deductible. We cant continue to help rescue horses if we don't have funding so each and every donation is so important in helping us continue saving lives. Thanks guys for your ongoing love and support... PS. The mystery prize is AWESOME!! Don't FORGET to email saveahorseaustralia@yahoo.com.au for a tax receipt. Thank you from the bottom of my heart for helping us help the horses.